What do you eat when you aren’t feeling good? What tends to boost your immunity when you have a cold or Flu? Chicken noodle soup! Besides being good, it is also good for you. There is something about it that helps fight through that cold. Runny nose. Inflammation. Cough. Yep! Helps all of them. Why? Even Science doesn’t know. But they do know, and report, that there is something about the combo of chicken and veggies that does the job. Let’s see if it helps my cold. Even tho’ mine doesn’t have a lot of veggies in it it does have three Chinese spices that are helpful during cold season – anis, cinnamon, ginger – which are antibacterial, boost immunity, and/or fight coughs. This was really good. The combination of the spices with the soy sauce and onions was spot on. Definitely a keeper. More Soup? Visit Wednesdays with Donna Hay. And if you want to join in the themes are on the right. The recipe is up to you. Just blog and leave us a comment. We’d love to have you. We don’t publish the recipes. We’d rather you buy a cookbook of Donna’s. Is pasta comfort food for you? Is it something you crave periodically? Nothing else will do but you really want to watch how many carbs you eat. Or you need more veggies. Then this dish is for YOU! Speghetti (I used low carb) tossed with sauteed zuchinni (with crushed garlic and red pepper). Topped with shave Parmesan it was the perfect low-carb veggie lunch. It was refreshing and light AND it was super quick to make. Always a plus. The recipe is a short order from Donna’s off the shelf: cooking from the pantry on page 30. More pasta on Wednesdays with Donna Hay. Want to join us cooking with Donna Hay. Just cook from any of her books/website, blog, and leave a comment each week. The themes are on the WWDH webpage. We haven’t done sweets in a while with Wednesdays with Donna Hay so this week’s theme – Small Sweet Sensations – was just right. Course I planned it that way by picking the theme. Donna’s food-processor cookies were calling my name. LOUDLY!! I’d like to say these were some of the best cookies EVAH! but I cannot. They were easy to make. All the ingredients, except the chocolate, in the food processor then add the chocolate chips M&Ms in a separate bowl. I found them to be rather tasteless except for the M&Ms. Oh, well. The recipe is a short order recipe from Donna’s off the shelf. Page 160. Want more sweet treats – Small Sweet Sensations – at Wednesdays with Donna Hay. 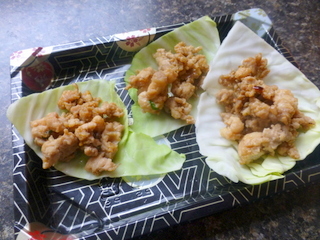 Which translates into simple, yummy, spicy chicken in lettuce cups! Simple because you can purchase ground chicken. Simple because if you make any Asian flavored dishes you have the ingredients in your pantry. You simply need some chillies, soy sauce, lemon juice, fish sauce, mint leaves and fresh coriander. Yep, in the pantry. I honestly didn’t think I would like this. The fish sauce doesn’t have the best fragrance in the world. But I did. Now, I’m sorry I only made 1/2 of the recipe. Oh, and I didn’t have the lettuce leaves to serve it in so I used cabbage. A little stiff but not bad as a ‘server’. The recipe, Kayte’s choice, is on page 124 of Donna’s off the shelf. Did the others like it as well. Check it out at the Wednesdays with Donna Hay website. Want to join the fun? Just leave us a comment on the website and we’d be glad to add you to the ‘membership’. FIRST I want to thank Peggy for her pick this week. I needed a quick and tasty dessert and this one was just perfect. SECOND – thanks to Donna Hay for the quick sweet treat. SHE is the reason I keep puff pastry in the freezer. 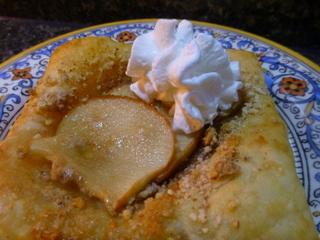 It is good for just about anything from desserts to pot pies to savory tidbits. This is pear season and ours are just beginning to ripen. I picked one, just one, and it was plenty for three galettes. I made mine with apple. This is super simple to make. Cut your puff pastry into squares. Sprinkle on some ground almonds. Layer some thin pear slices. 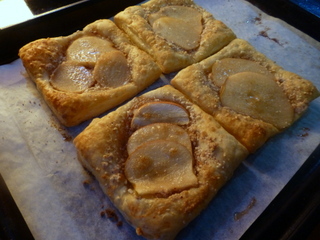 Brush the whole thing with melted butter and then just bake at 350 until the pastry turns golden brown. No measurements. Put as much or as little of the pears and almonds as you like. This dessert is all about YOU!! The ‘recipe’, if you want to call it that, is on page 160 of Donna’s off the shelf. I bet the other members of Wednesdays with Donna Hay liked this one, too. Today was a fun day in the kitchen. My son is in town and he likes to cook so we made this week’s ‘assignment’ together. 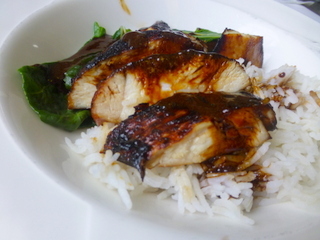 Chicken breasts are poached in a brown sugar, soy sauce, cinnamon, star anise, and rice wine mixture. Then fried to crispyness. Thus the name, “twice-cooked”. This was good. I served it as Donna suggested with some steamed greens and jasmine rice. Donna listed chicken breasts with skin but I never buy them so went with the skinless. It was still nice and crispy because of the sugar in the poaching sauce. The sauce thickened quite a bit so I thinned it with a little extra soy sauce and drizzled some over the chicken and steamed bok choy. The recipe is on page 120 of Donna’s off the shelf. If you would like to join us just check the recipes on Wednesdays with Donna Hay and leave a comment there. We would love to have you. No commitment. Just fun. And to see how the other members liked the chicken – WWDH. There are times when our lives take a tumble. Time when we want what we cannot have. Times when we feel failure. Times when we lose someone important in our lives. Times when we feel sorrow for someone else’s loss. This was the case this week when we found out that Deb, one of our administrators in I Heart Cooking Clubs, had lost her Mom. So we are virtually sending her hugs with comfort food. Food that wraps you up and makes you warm inside. Food that brings back memories, feelings, joy. Deb – this is for you. It’s all we can do from afar. If you look on page 30 of Donna Hay‘s Off The Shelf: Cooking from the Pantry you will see the recipe for baked carbonara. She lists it as ‘short order’. Presumably because it is quick. And it is. By the time the sauce is put together the pasta is al dente and ready to be mixed with some nice crispy bacon. What you end up with after baking the mixture for 30 minutes is…. …which you use as a main or a side. Either way, it is GOOD. 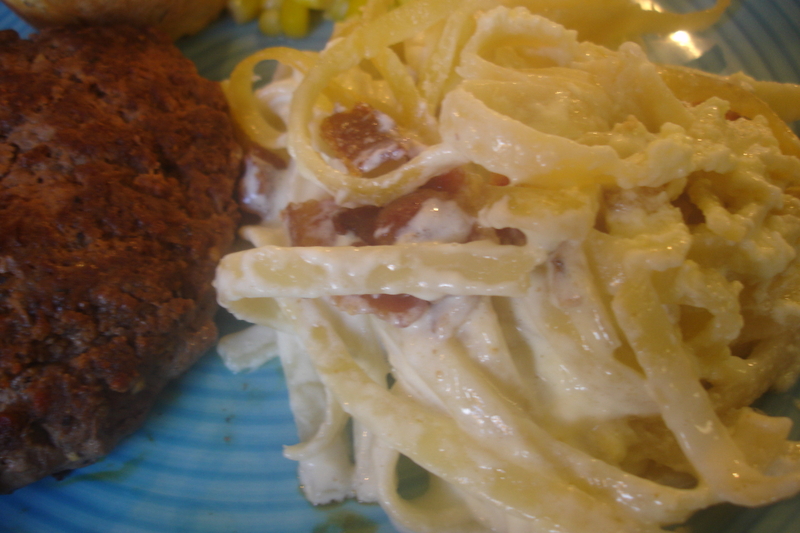 The cream, milk, egg, and Parm cheese all comes together resulting in a creamy pasta. 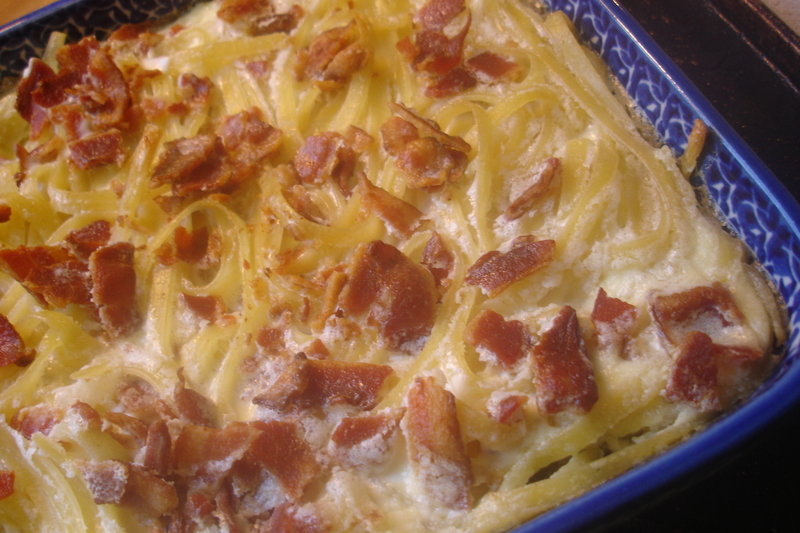 I would not change anything except instead of just pouring the cream/milk/egg mixture over the pasta I would mix it all up in larger bowl with the the bacon and then put it into the baking dish. Good Stuff Y’all. Cook pasta til al dente and drain. Whisk the eggs together with the cream, milk and Parmesan Cheese. Place pasta in an ovenproof dish large enough to hold all the ingredients. Top with the bacon and egg mixture. Bake at 350 for 30 minutes or until set. What else is on the Potluck this week? I Heart Cooking Clubs is cooking for Deb this week.